LoA found out more about this progressive company that is really making an impact this month. Minimal is a startup business, focusing on the design and modular construction of houses, offices and minimalist facilities for business development, all based on containers and metal profiles. In Mozambique 51% of the country’s population is composed of young people. The huge number represents a challenge to habitation programs developed by the government for young people. Of that number how many have the possibility to participate in those government programs or access credit to buy a decent house and facilities (installations) to start their own businesses? The answer is, very few! That’s why we came up with the idea of Minimal. We are talking about accessible, adaptable, flexible and sustainable solutions to this challenge. Because at Minimal, we are creating genuinely high impact, accessible and flexible solutions to the access to housing and startup business premises challenge. Our solution is more affordable than a regular house and it is quicker to have your module house built than it is to import a car from China. Secondly, people will have the possibility to rearrange the order/position of the modules to suit their own individual accommodation needs. In addition, our solution offers people the mobility the need in their lives and businesses as they can move the modules from one location to another if there is a need. Finally, the possibility to build our housing in different phases is a huge advantage for our customers, since you can buy one module and add the others according to the needs and timeline requirements of the client. All these advantages make our solution hugely attractive to our customers. It is our vision to try to create a modern concept to the Minimal Living Box. At Minimal, our team is composed of creative young people all of whom come with a strong WHY. Basically, we are young people recently graduated in various areas such as engineering, architecture and design, whose main goal is to revolutionize the construction scenario in Mozambique and bring accessible, sustainable and modern concepts to the marketplace. I am a Mechanical Engineering student with a strong interest in design and sustainable construction who believes in young people's ability to innovate. I recently embarked on my journey of entrepreneurship. 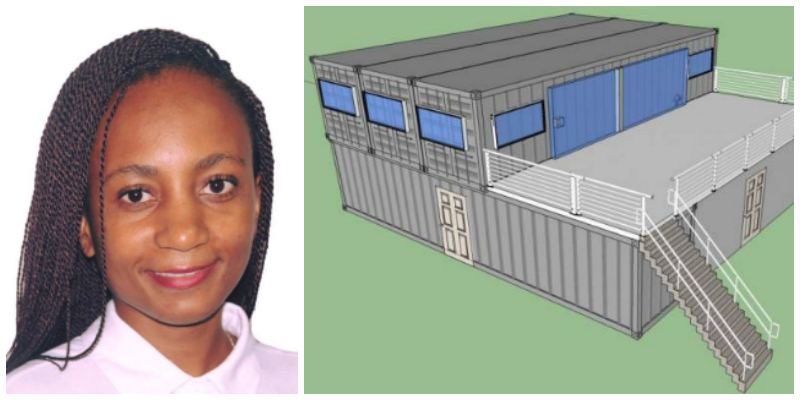 My passion for engineering led me to incorporate local materials, containers, and modular construction technology, to create more and better opportunities for access to commercial facilities and offices for the youth market, all at competitive prices. This is how Minimal was born, a modular design and construction startup based on containers and metal profiles. Awarded as one of the 15 best Startups of the Year by Total, edition 2018/2019, Minimal allowed me to receive the award of Best Female Entrepreneur of the Year. At the moment, my role is as Structural Designer at Minimal, and I am working to make available modules adapted for housing and / or commercial use, enabling solutions tailored to the needs of our customers. Our Minimal construction designs are capable of being both sustainable and mobile. Our goal is to develop and expand our sustainable modular construction projects, making Minimal a reference point for immediate, practical and ecological construction solutions at competitive prices. What gives me the most satisfaction being an entrepreneur is to solve problems, somehow improve people's lives, and surely profit during the process.